This is was the big one. It is going to cost a ton. 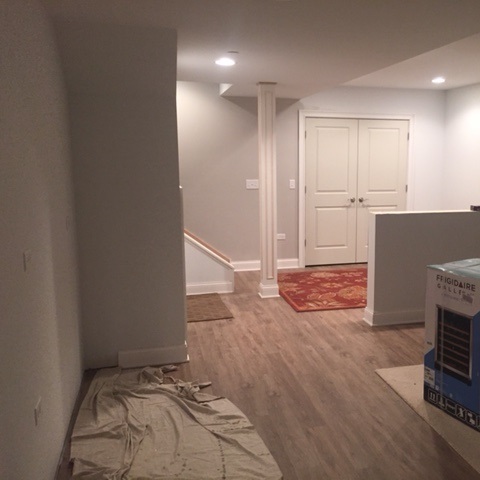 But it's a fantastic blank canvas to work with - our unfinished basement. We'll be installing a second home theater downstairs, along with a couple of TVs, a bar, a pool table, and so on. We're currently restoring a 1960-70's era Deutscher Meister coin-op foosball table, which largely means "cleaning 50 years of dust off of the men/surface/foosballs, fixing chipped laminate, and polishing chrome wherever we can." My father-in-law says he's giving us a 100+ year old Brunswick pool table once the project is finished, which provides some serious motivation. 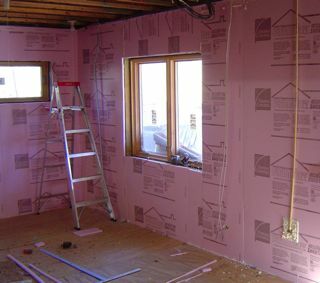 We've been taking bids from a handful of companies who can do the "rough-in" - that's plumbing, electrical, framing and drywall. 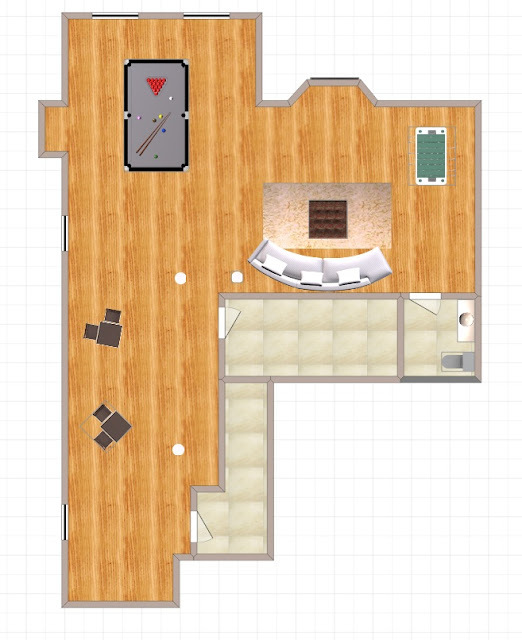 Everyone agrees that my floorplan, above, isn't ideal. We're going to be adding a bedroom near the "top" of that floorplan, where the pool table appears. 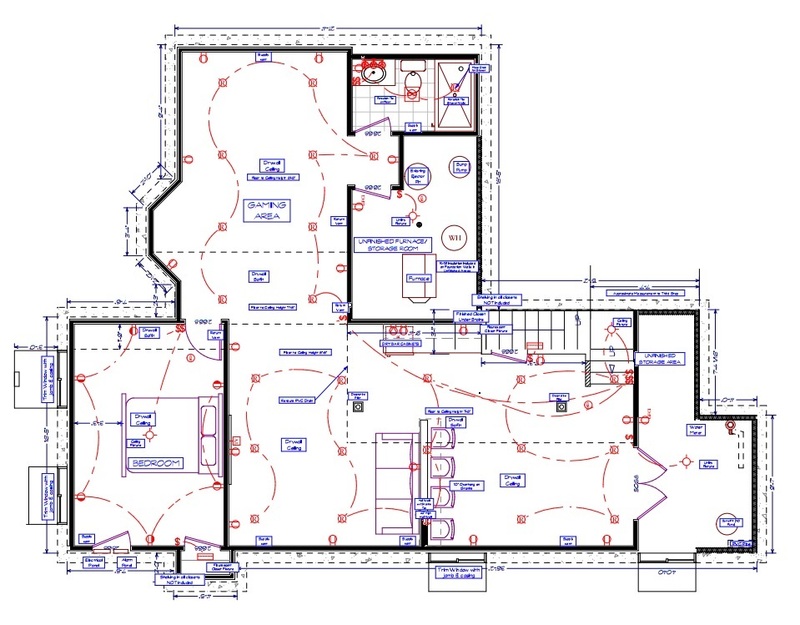 We're also going to be "turning" the stairs, and creating an unfinished storage ahead near the "bottom" of the floorplan. That will make our house a 5 BR / 3.5 bath, which will allow us to recoup more equity from this large investment. It's going to be a 50-day install JUST for the rough-in. That will take a substantial amount of this winter. UPDATE: December 2015 - We're underway! It's 2 major "open spaces", with a bedroom, bathroom, utility room, and a storage room added. One of the coolest decisions we've made is to tuck the bar under the stairs. 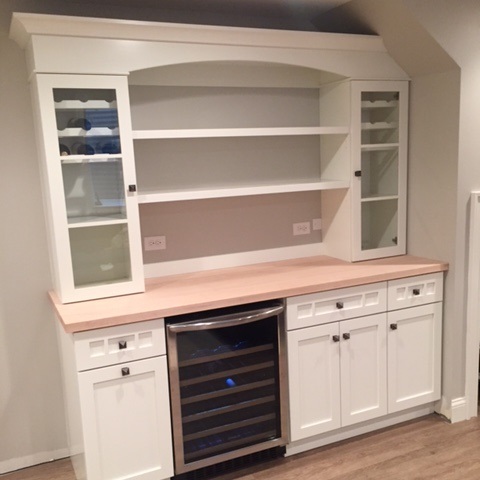 It will mostly be wine storage, a beverage cooler, and a countertop - there won't be room for upper cabinets. This isn't ours. This is from Pinterest or something. But it will be out of the way, and have more visual interest, being underneath the staircase. Cleaning out the basement was a MAJOR effort - and the crew took most of December and January to finish. But finally, we're done with the rough-in. Here's our basement, sitting at the unfinished drink ledge. Bedroom door to the right. The finish work is up to us - and we'll likely take our time, do a number of projects ourselves, and finish in mid-2016. In the meantime, the basement will be usable "fun" space for the kids. The finish work is wrapping up. We laid a NuCore floor throughout the entire area, and the only remaining work is paint - and the bathroom. The project was finally completed in early 2017. Butcher block countertops, sealed with Waterlox. Thank you for give vastly nice info. Your web page is cool. Bookmarked this page, will come back for further. With 2,000 lumens offered, you do not ought to relegate your theater to the dark basement any longer - place it any space you like; close lightweight from windows won't have an effect on this image.More usually than not buzzing through your speakers is caused by a grounding downside, for more information click here home theater fort lauderdale. I am interested in the NuCore Flooring. I read a review that it dents where heavy furniture legs rest on it. Have you had an issue with this? Thank you. I haven't seen any denting in our NuCore - and I have moved our entertainment center left and right quite a bit.